With the advent of cable TV, internet, and now mobile phones, our pastime activities have got more and more confined to the indoors. A lot of us spend weeks and months without any proximity to natural surroundings. But studies have shown time and again that getting involved with nature makes us healthier and happier, and not just because of the little bit of exercise we might get in the process! Spending time with, interacting with, or even just observing and appreciating nature can have a marked difference on our happiness and vitality. Here are some ways in which being connected to nature promotes a sense of happiness. How Does Spending Time With Nature Make Us Happier? Spending time outdoors and interacting with nature, causes a shift in our perspective. We remember that we are not alone, that we are a very tiny part of something infinitely bigger and grandiose. And that helps us ACCEPT things as they are. (Covered under 'A'). We understand that everything around us has a role to play, and so do we. Promotes A Sense of Gratitude. My shop is just a 2-minute walk from my building, but even that little bit of time fills me with GRATITUDE (covered under 'G'), as I notice all the trees along the way and the clear blue sky above me. And I'm reminded how nature provides for all my needs. Most of all, it reassures me of my own place in the grand scheme of things. You look up any article on dealing with writers' block, and one of the suggestions will be to spend some time in nature! nature fuels our curiosity. Why do apples fall down and trees grow up? How do birds fly and fish swim? nature is perhaps the biggest source of INSPIRATION (covered under 'I') for human minds. Makes Us Kinder and More Generous. Exposure to nature has scientifically proven benefits on our physical and mental WELL-BEING. (Covered under 'W'.) It strengthens our respiratory and cardiovascular systems, and alleviates depression. It relieves the attention fatigue and "burnout" caused by constant information overload in these times of ubiquitous technology, and restores our depleted mental circuits to their normal health. Richard Ryan, a professor of psychology at the University of Rochester, says that "nature is fuel for the soul". His advice to us is that when we feel tired and reach for that cup of coffee, we should instead go for a stroll in the park. Nature makes us "feel more alive". No matter how busy our schedule may be, we must always try and find some time to appreciate the beauty and oneness of nature around us. How do you make time for nature in your life? Do you have your own vegetable garden to nurture? Or a dog perhaps, to lead you in search of rabbit holes? Or are you a part of some photography group that holds weekly "photo walks"? How do you get your daily dose of nature? This is my 14th post for A to Z of Happiness. This is all so true. Getting out in nature also helps us ergonomically. Sitting at a desk or keyboard or hunched over a cell phone leads to unhealthy postures, while getting out in nature helps us recapture the way our bodies are supposed to move. Happy AtoZ and I'll have to check out your book! Nature is wonderful. Nice to be surrounded by natural beauty. Getting lost in nature to find ourselves makes sense. Most days I walk in my neighborhood. I am blessed to have a balcony with a beautiful view of the city trees and of course, I have my flowers to enjoy. Yes! Spending time in nature is like a therapy for me... and it's just one minute of will power to decide to get up from bed or not.. And it's totally worth it! We have so much to learn and absorb from nature. Agree with everything you've written here. We should all just get away once in a while, turn gadgets off and go to at least the neighborhood park and inhale the fresh air. Works quite like meditation. I absolutely love nature. I have balcony gardens in 3 of my balcony and my bedroom windows .I never travel anywhere for vacation without nature around.Great post. What an amazing post! 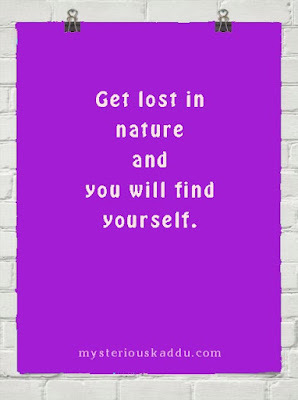 True, being amidst nature does bring a wonderful feeling of happiness!! And I loved the pointers that you gave, even more reason to love nature! The first thing I want to do in the morning when I wake up, is to walk out on my terrace and absorb the goodness of nature - the greenery, the skies and the fresh air. Nature can do wonders with our day ahead. Love the thoughts expressed in this post, Chicky. I think most of all Nature helps us see ourselves in relation to a much much larger Universe, that that puts things in perspective. Suddenly our perceived problems look diminished. I love your post, Chicky! Indeed nature do wonders especially when we are in depression. Just today we organised a Silent Nature Walk for our client and it was such a rewarding experience. We enjoyed the stillness around and mindfully appreciating the beauty around us. Of course, it relaxed us as well. Oh yes, that's a very valid point, Molly. The posture, plus the eyes! So much strain on them too! Chicky, love the post - every point you make so true... nature is indeed fuel for the soul. I need to get out more and I am lucky to live in an area where great hiking trails and the great outdoors are really close by.. It soothes our soul, doesn't it, Princess? Yupp... the fresh morning air! Nothing quite like it, Vinodini! Exactly, Vidya! All our problems suddenly become so tiny! Where did you go, Shilpa? Where do you stay, Lady In Read? It must be really cool to have hiking trails close by! Have a great trip, girl! And come back fully recharged! Nature is basically the first thing that you actually notice about a person and that makes you tag along with them. Well written! I hope you have a better health now and picking up with your challenge. It should be real frustrating right? Hello Anmol. I skipped two posts (L and P). Haven't been able to get to them yet. Will try to do at least one tomorrow.